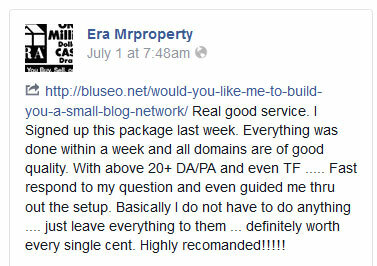 All of our network domains were purchased on auctions and are aged what is a clear advantage over expired domains. Each domain has a clear history and was never used as a PBN before. We like domains which were previously regular company websites without any drops in the registrar. Before a domain is entered to our network, we make sure it is indexed and passes our penalty check test. Next we post sample content to make sure everything is super safe before we start linking out. We do not spare any costs or cut any corners here. These are quality PBN links you won’t get anywhere else for this kind of pricing. We are able to drive down our costs since we are a PBN hosting company which means we have a ready infrastructure and don’t need to invest additionally in servers in order to build a PBN network and sell links. All our private blog network are located on different servers than we offer in our hosting packages, which means you can safely get started with our PBN links here and later build your own network with one of our hosting plans. If you are just starting out with a fresh domain, consider getting a Social Boost package first before you start linking from PBN sites. *By clicking the “Buy Now” button you acknowledge you have read & agree with our Terms of Service. 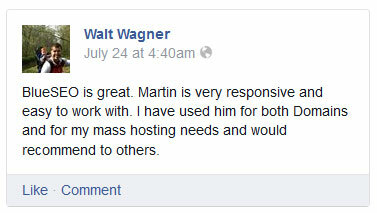 More testimonials on our LinkedIn profile. Can We See The Domains Before We Purchase? You will receive the list of our PBN urls 32 days after your purchase. We can prepare generic, non-niche specific articles for you. You just give us your urls and anchors texts you want. In that case you would need to order x2 what amounts to $194. Can You Make It Hands Free For Me? We can analyze your website, research your existing backlinks and anchor texts and map out a back linking strategy tailored for your domain. We will do the analysis in a form of video so you could see how we gauge and prepare our linking campaigns. We will also suggest what needs to be optimized on your money site before we start the PBN linking process. Extra consultations over Skype are also included in the price. For this hands-free option please order the gig x3 what will amount to $291. What Do You Need From Me Once I Order? You should have 30 unique articles ready. Articles cannot be spun or grammatically incorrect. We reserve the right to ditch articles that don’t pass our standards. Because we allow up to 6 links per post, you should also have your other links ready- social profiles, youtube videos, citations or a list of authority sites you want to mix in with your own urls. What Are Your Recommendations Regarding Anchor Texts And 3rd Party Urls? Each post should appear to be unique not only when it comes to the text itself but also to where it is linking out. That is why we allow 6 backlinks per post. Each time you can use the extra slots to link out to your different videos, social profiles or authority sites. If you copy the same urls to every post, it will leave footprint and won’t do much for you in terms of rankings. What Is The Recommended Drip Feeding Period? We recommend irregular intervals when drip feeding your posts to our PBN link network. Intervals can vary from 2 to 7 days. If you want to be super aggressive, you can distribute all links within 60 day period with 1 link every 2 days velocity. We recommend 90 day period. SEO is a game of patience. Links will never have an immediate result to your rankings and you need to understand that. From what we have observed, at present it can take Google 3-4 months before a link fully kicks in and impacts your rankings. Most important is patience and consistency. Only then will you see good results. Can I Build Other Links To My Website During The Drip Feed Period? It depends on how aggressive you want to be and how old your site is. With new sites we recommend first to build profile links – social and citations. These are usually URL links and will prepare your domains for more anchor optimized PBN links really well. See our Social Boost packages for details on that. Remember that link variety is a good thing. Which means posting a comment or forum profile here and there will only do you good provided you choose good, healthy sites. What Happens If I Want To Change Something? We do not recommend tinkering with anchor texts once the post is indexed. Google doesn’t like it and it looks fishy. If a change needs to be made, the whole post is deleted and a new article is posted with the implemented changes. You can have 2 revisions within 12 months time. My Website Tanked 2 Weeks After You Started Drip Feeding? Not to worry. If you got your anchor texts right, this is just something what is called “Google dance”. Your rankings will rapidly go up and down during the process of back linking so do not panic. If you start making changes and tinker with your existing back links and anchor texts, you will only make things worse. What Is The Niche Of Your Network Domains? The network is not niched per say. The general theme in usualy blog, news or marketing. Your article will be posted in a category we see fit. If there is no category for your niche, it will be created. How Many Homepage Links Are There Going To Be? Articles are posted on homepage in a form of excerpts. Our PBNs usually have 20-30 excerpts diplaying on the home page before they start rolling off. We display categories in sidebars or footers so your posts are always a click away. I Want A Home Page Link? Home page link on a website that is not niche relevant to your money site will not do you any good. Google is all about relevancy these days. A relevant link from a weaker url will count more as a link from a strong irrelevant niched site. Note that Google looks at a title, domain, url and description when determining relevancy. If you place a home page link, it will index with a root domain which is irrelevant as well as main title of the site it is not, which will also be irrelevant. On the second hand, if you post your article so that the links don’t appear on PBN’s homepage, just the excerpt, than it will get indexed with the proper title and the full url. They will both contain keywords and be relevant to your niche what makes it a much better and more valuable option.